Medical device manufacturers can now meet the need for smaller, lighter, more discreet drug delivery units thanks to the addition of a unique material solution from Sabic’s Innovative Plastics business, highlighted at InnoPack, a packaging and pharmaceutical show in Paris. Sabic will also highlight two new grades of high-modulus carbon fibre-reinforced thermoplastic, which support the growing shift away from using traditional metal or other fibre-filled materials in medical devices, in order to help reduce costs. 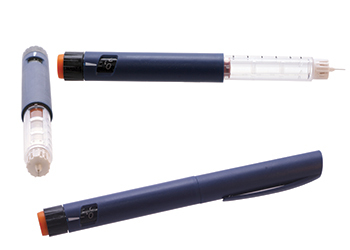 As the healthcare industry moves towards greater outpatient care and home administration of medication, manufacturers of drug delivery devices, such as insulin pens, need to develop solutions that are easy to use, compact and aesthetically pleasing to patients. Sabic is helping its customers adapt to this trend with its new Cycoloy HCX1640 resin, which can enable manufacturers to design robust, light and attractive drug delivery devices that meet standard healthcare regulations. "Today, more patients are administering their medication at home or on-the-go, and therefore they need to feel comfortable with their drug delivery experience. By offering discreet, lightweight and attractive devices, healthcare providers are responding to the needs of a new generation of patients who require easy to use equipment in order to safely and accurately administer their own medication," says Cathie Hess, director of Healthcare Marketing for Sabic’s Innovative Plastics business. She adds: "Our new material helps manufacturers achieve thin walls and dimensional stability, as well as improved weld line performance and impact resistance, meaning that the devices are safer and less likely to break. These features also allow manufacturers to create complex designs that are capable of integrating an increased number of mechanical or electronic features. Additionally, the resin has a wide range of colour options, helping to create an attractive design that appeals to patients." A growing opportunity for medical device manufacturers includes a shift from using traditional metal or other fibre-filled materials in their applications to plastic. Sabic is working with its customers to support this shift with two solutions that offer medical device manufacturers the potential to optimise system costs as well as improve processability. These two grades of high-modulus carbon fibre reinforced thermoplastics show significant improvement in stiffness versus similar compounds with standard carbon fibre technology, making them excellent candidates for replacing metal and other fibre-filled thermoplastics. Sabic’s Lubricomp DCI06APH compound is a high-flow material suitable for high-strength components where the use of metals or other fibre-filled thermoplastics with poor flow can create design and manufacturing challenges. The compound enables complex part designs and potential part consolidation, enabling healthcare molders to reduce waste and improve cycle times. Potential applications include disposable surgical instruments, medical device housings as well as drug delivery device components. Designed to be comparable to the strength of metal, Thermocomp EC006AQH compound enables medical device manufacturers to expand their use of injection-moldable engineering thermoplastics for several reasons. These include the potential for reducing system costs, achieving greater design flexibility and enhancing device compatibility with image guided surgeries. Additionally, replacing metal can also enable part consolidation, which can reduce both the effort and cost of manufacturing devices. Potential applications for this compound include either disposable or re-usable surgical instruments, patient transport devices, fixation devices and medical device housings.